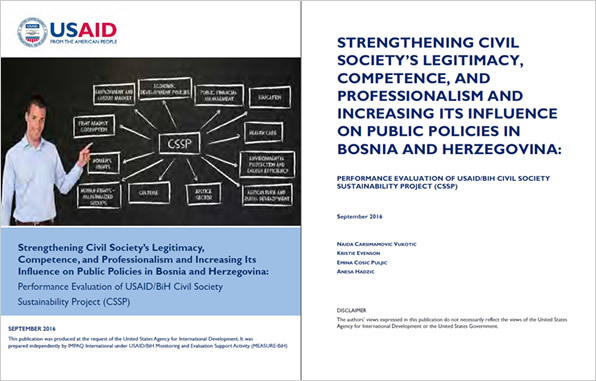 Performance Evaluation of Civil Society Sustainability Project (CSSP) is the fifth evaluation and the third performance evaluation conducted by MEASURE-BiH for USAID/BiH. 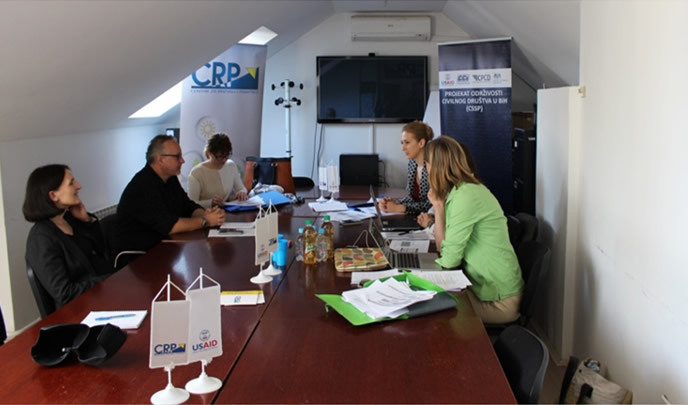 CSSP is a $9.15 million activity financed by USAID/BiH to strengthen and maintain the capacity of BiH civil society to influence the creation and implementation of public policies of interest to citizens. USAID designed CSSP interventions to address five main problems: i) lack of government engagement with civil society, ii) inability of Civil Society Organizations (CSOs) to influence public discourse, iii) lack of CSO professionalism, iv) weak sustainability prospects of the civil society sector, and v) lack of reliable and unbiased information. The CSSP intervention began on September 1, 2013 and is expected to last until August 30, 2018. To what extent have interventions under CSSP increased CSO partnership and advocacy agenda consensus building with other stakeholders (government, media, and private sector)? To what extent have interventions under CSSP strengthened the capacity and viability of selected CSOs in the 12 sectors? To what extent have interventions under CSSP increased engagement of civil society and citizens in governance, and what was achieved within the 12 selected reform areas? Which performance-related intervention factors could be adjusted to address intervention concerns and align CSSP activity with its articulated objective for 2018, and based on CSSP’s achievements and challenges, what are the lessons learned for future interventions in this area? We employed a mixed-methods approach in conducting this evaluation. Although performance evaluation cannot assess the extent to which results can be attributable to an intervention, it can provide valuable information on how an intervention is being implemented, how it is perceived and valued, and to what extent the expected results are occurring. The data from above-listed sources are triangulated to address the evaluation questions from multiple perspectives.